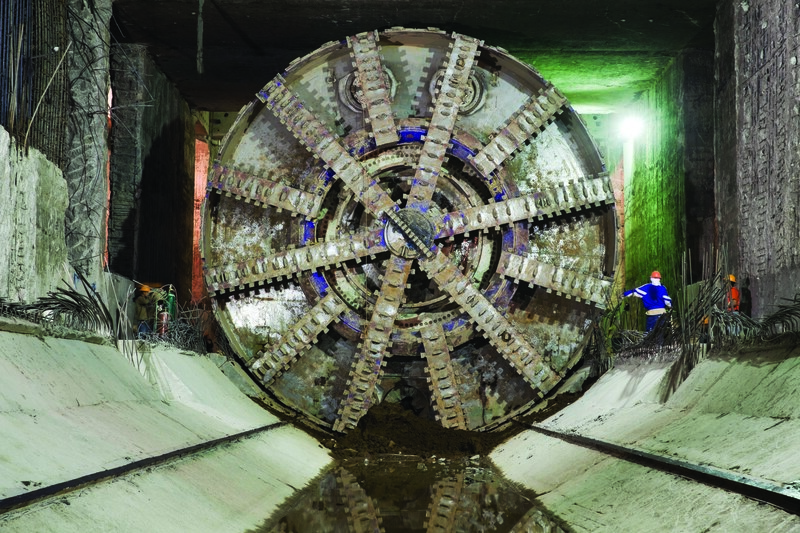 Mexico’s largest TBM, a 10.2m (33.5ft) diameter Robbins EPB, completed its successful tunneling run on March 1, 2012. The machine, for a consortium of ICA, Carso, and Alstom, excavated 7.7km (4.8-miles) of tunnel in highly variable ground including watery clays, cobbles, and large boulders. The new metro Line 12 will be the first in a decade for Mexico City, a rapidly growing metropolis of over 20 million people. The tunnel route took the Robbins machine to within meters of a 16th Century church, active sewer lines, building foundations, and other structures. Real-time settlement monitoring was rigorous throughout the project and the crew was diligent in maintaining earth pressure during excavation. TBM elements including a two-liquid back-filling system with rapidly hardening cement also aided in settlement reduction. “Settlement stayed within the limits of between 2cm and 5cm (0.8in to 2in) throughout the bore,” said Ismail Benamar, ICA Tunnel Manager from the TBM launch through 2011. The complexities of the densely urban project location have been a hallmark of the project from the start, when the machine underwent Onsite First Time Assembly (OFTA) from a shaft on a city street. “OFTA has the benefit of no pre-assembly–everything was delivered directly to the site and assembled here. The assembly went very smooth, and it was a little over three months before we started to turn the cutterhead and push the machine forward,” said Ron Jelinek, Robbins Field Service Technician. The machine was launched from the small shaft in February 2010 and proceeded to break through into seven cut and cover station sites ranging from 150m to 190m (490ft to 620ft) in length. During each hole through, the machine underwent routine maintenance and was re-launched. Despite the numerous intermediate stations and the time required to walk through each station, advance rates topped out at 135m (443ft) per week, and averaged 400m (1,300ft) per month. Custom EPB features aided in the efficient excavation, and included a two-stage screw conveyor with an initial ribbon-type screw to allow the passage of boulders up to 800mm (2.5ft) in diameter. Active articulation allowed the machine to negotiate tight curves down to 250m (820ft) in radius with no segment deformation. Upon completion, the 25.4km (15.8-miles) Line 12 of the Mexico City Metro is the longest in the system. The Mexican Federal District predicts that the new line will carry an average of 367,000 passengers daily, making it the fourth busiest commuter rail route in the capital.